President of Dow Sub-Saharan Africa, Ross McLean, told the recipients of bursaries from the company that their journey towards a career in chemistry would require vision. ‘We can help a bit but most of the energy will have to come from you,’ he said. McLean visited Wits along with other senior members of Dow and spoke to the students about what made them choose chemistry. Bursary recipient Pearson Mururi said he enjoyed the fact that chemistry enabled him to solve problems that were relevant to everyday life. Bursary recipient Kamogelo Butsi said she’d chosen the subject because she enjoyed organic chemistry in Grade 12 and thought that chemistry would be a good platform on which to build her career. 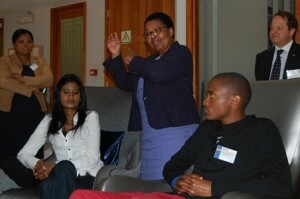 Managing Director of Dow Southern Africa, Sazi Lutseke, described her own career path which began in chemistry. Article issued by Wits University.